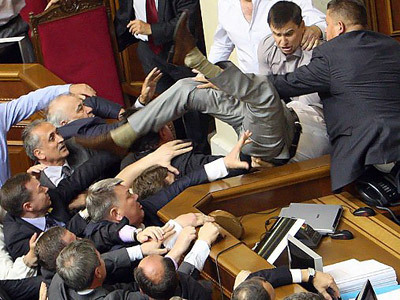 The head of the Ukrainian parliament has admitted that the legislative power system in the country has failed after several MPs started a fistfight over the status of the Russian language. Vladimir Litvin said that “the parliamentary system in the country was completely destroyed” as he spoke to reporters at a briefing dedicated to the fight that took place at the latest State Rada session while MPs discussed the status of Russian in the country. 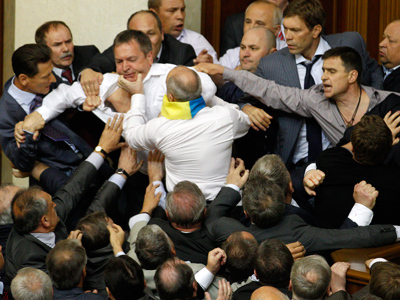 “I have suggested a political decision – admit this fact and vote to dissolve [the Rada] and to announce out-of-term elections,” the speaker told the press. However, he also said that the parliament did not support his suggestion. 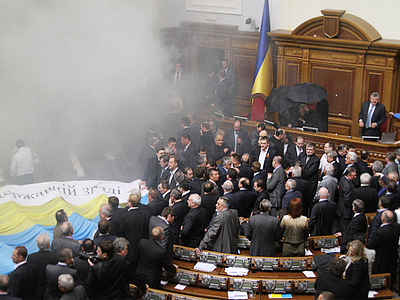 The official said that currently the Ukrainian parliament is considering several options over the fate of the Russian language bill – in particular, to stop discussing it, to postpone the discussion until better times or to approve the document in the first reading and order a working group to amend it before the second reading is held. Other parliamentarians told the press that they considered the speaker’s suggestion little more than attention-seeking. The head of the pro-presidential Party of Regions faction, Aleksander Yefremov noted that Ukraine has already seen a period of self-dissolved parliament, and that this move brought the country no good. The bill that caused the strife in Ukrainian parliament and society suggests that Russian could become an official language in regions where 10 per cent of the population or more are Russian speakers. The bill is supported by the Party of Regions with its base in Russian-speaking industrial Eastern Ukraine. Nationalist opposition with supporters in the West of the country opposes the bill, sometimes through extreme means.